Love the lake? Surround yourself with water. We offer a large family & entertaining condo to discover… before anyone else does. Move almost everything you own into this one-of-a-kind northside Chicago condo -- it's 3,632 sq. ft. with 3-5 bedrooms, 4 full bathrooms, walk-in closets and storage galore. Nearly a penthouse, you'll own half of the 41st floor! If you are considering moving to a large, luxury condo on the north side of the city, one with sweeping views of the Chicago skyline and panoramic views of Lake Michigan from every window, then we should talk. Modern, elegant and chic, from our living room we can see sailboats and the green lakefront in the summer, ice floes in the winter, and the changing colors of leaves along Lake Shore Drive in the fall. Simply beautiful. 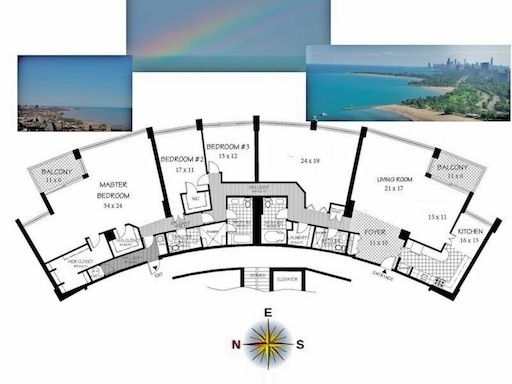 My parents sold our large home in Evanston when this unique space came on the market. It was love at first sight! Ours is the only double condo in the most upscale, low-density building along this north stretch of lakefront. As the easternmost building, our views are joyously unobstructed. We’re tucked away behind the seawall on the Glenlake Avenue cul-de-sac; from the stoplight at Glenlake and Sheridan Road, head one block east and look left. The Carson's Ribs restaurant owners originally combined our units, 41B & 41C, and since then, several well-respected physicians and their families have called it home. The condo is lovely, with custom details, a large master suite, and lots of space for storage and entertaining. Happily, we were able to fit most of the contents of a large suburban home into this super-sized, luxury condo. An easy move. Hard to say what we’ll miss most -- the practicality of having heated indoor parking in winter (with free valet & weekly carwashes) or the beauty and fun of having a glass-enclosed swimming pool on the roof. The garage is efficiently run by people who are genuinely friendly, helpful, and protective of the vehicles in their care. But the pool is breathtaking, surrounded by glass walls with stunning, 360° panoramic city and lake views. From our bedroom door, we just walk upstairs past one floor to reach the exercise room, sauna, free lending library, and pool (or take the elevator if we're feeling lazy). We've since met people in the building we now consider to be dear friends for life. Given that East Point does not allow renters -- it's 100% owner-occupied -- residents are committed to having an upscale but friendly place to call home. Great for grand-kids and extended families, too. When our son was little, he loved seeing the occasional coast guard helicopters fly by at eye level. Our daughter loved watching a hawk fly over the pool – it nests on a neighboring rooftop. The kids found friends their own age, and we found friends of all ages. Just before we moved out, we rescued a pup via Chicago Canine Rescue – even she loved having so many pals in the building! (The dogs typically ride the service elevator, by the way, and avoid the lobby.) East Point Condo places no limit on size or quantity of pets. Please come by -- I'm happy to show the condo anytime. We’ll be holding drop-in open houses on Saturdays and Sundays from 1pm-3pm, but if you’d like to come at another time, just call, text or email me. East Point Condo has the urban beauty of the Chicago lakeshore without the congestion and messy traffic of the Gold Coast. Here, your investment goes farther, giving you value, space, and unparalleled views of the Chicago skyline. Photo courtesy of Ron Hayes, www.ronwahphotography.com Condo: $734,500 Views: Priceless!